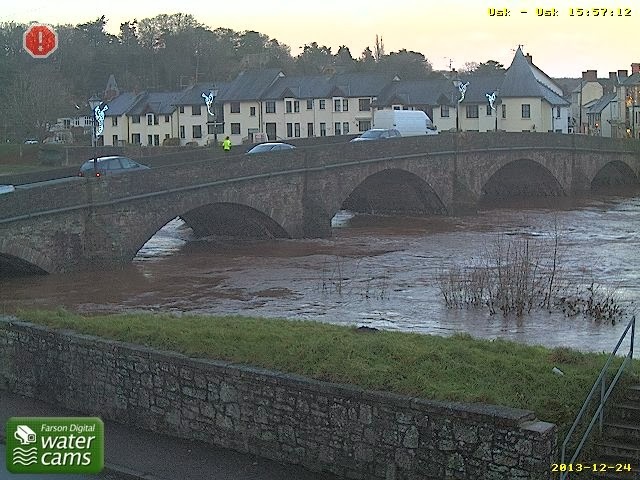 Water, it's what's on the minds of a lot of people in Usk this Christmas Eve. 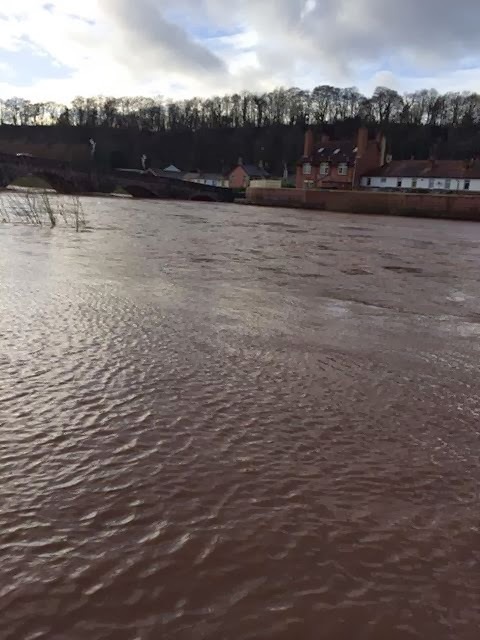 After torrential rain yesterday, the levels of the two main water courses the River Usk and the Olway Brook, that flank the town, are both running fast and red (with deposits from the red Monmouthshire clay they run through) and very high, presenting a threat to low lying properties on the outskirts of Usk. Thanks to the excellent flood defence system, with it's high banks channeling the river away from the town and out on to the river meadows lying to the South, Usk, has so far been spared becoming a lake this Christmas. But this was not always the case. When my grandparents first moved to Usk in 1937 and until after the last major flood in the Winter of 1979, when the 'Town Water' part of the river course was straightened and the high flood defence banks were constructed, the town itself flooded on a fairly regular basis. 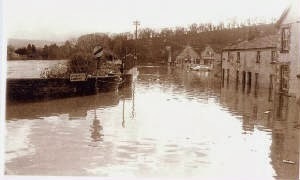 Many of the pubs in Usk have old photographs on the walls of floods in Usk and some have marks on the walls showing water levels. My Gran talked about my Grandad going down Bridge Street in a rowing boat helping to deliver bread and milk to people stranded upstairs. In 1979, I remember that the flood water reached my Gran's doorstep at the bottom end of Mill Street but thankfully it didn't go into her house. 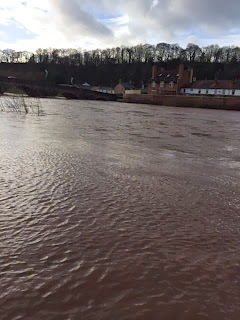 Flooding still remains a risk for Usk residents and recent research done by Usk Professor, Simon Haslett, of Cardiff University indicates the Usk Valley may be more susceptible than ever to flooding in the future. 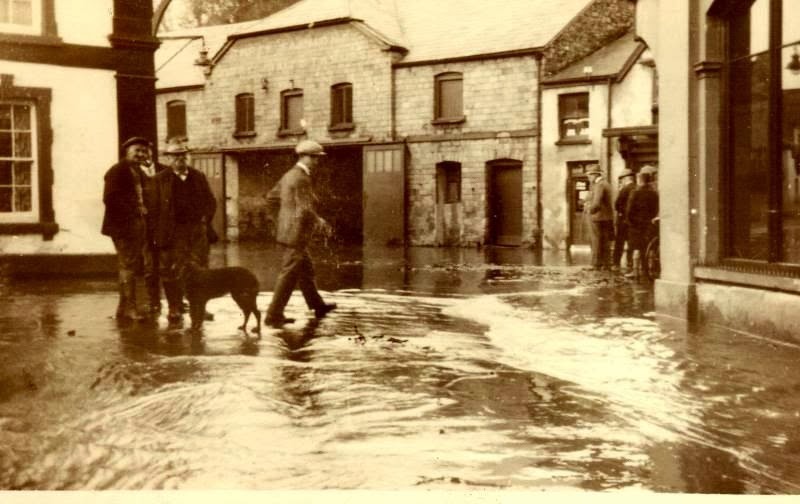 You can read Professor Haslett's fascinating article 'Flood history in a South Wales Valley' here. It's a good thing we now have flood banks to protect us in Usk or many more of us would be facing the scenario below . 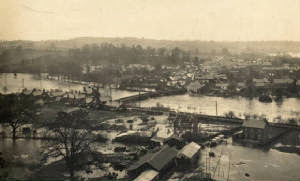 Some old photos of Usk under water before the flood defences were built. Unfortunately I don't know the exact date these were taken although the first one taken looking towards the corner of The Three Salmons is older than the other two, which I would guess are probably 19760s/ 1970s. Although most Usk residents currently remain dry, flood water is causing havoc to the travel plans of many in the area this Christmas. I only just got home from my work place yesterday, with the road closed by flood water from the Berthin Brook at Little Mill and water rising through the drains at Llangybi and Llanbadoc. Last night we went to a Christmas party in Chepstow, near the River Wye and gave our friends Linda and Stewart a lift home to Beachley at around 12.15 am. Well that was the plan, when we reached Sedbury the road was completely blocked by deep water and the alternative route, a rough lane, was now virtually impassable in an ordinary car due to debris being washed down it. In the end I loaned Linda a pair of wellies which I keep in the car and they managed to walk home via the rough lane, having first tried walking through the flood which proved too deep and dangerous in the dark.